What if doctors’ prescriptions were not for pills, but for parsnips? A national initiative with local roots aims to revolutionize healthcare. In 1939, two California buddies, Bill Hewlett and Dave Packard, started their eponymous company in Packard’s garage. Their breakout product was a piece of audio equipment that they sold to Disney to improve the sound for the movie Fantasia. That kind of backyard innovation has yielded the world’s most transformational technologies. Six of today’s billion-dollar companies have similar garage origin stories: Apple. Microsoft. Disney. Google. Amazon. HP. What if there were a grassroots, ground-floor, open-source kind of way to tackle our nation’s healthcare crisis? If there were smart people working in small teams, all across the country, developing ideas as revolutionary as the Apple I computer? There is. And one of those “garages” is here in the Ohio Valley. But before we can get to that story, we need to take a step back and look at the current state of American healthcare. Modern healthcare is neither modern nor healthy. The medical economy is built to treat illness, not to promote wellness. The reasons are complex, but the biggest one is financial: Profit is generated when more surgeries are scheduled, more hospital rooms booked, more patients seen, more drugs prescribed. Compensation to healthcare providers from insurance companies or the government is based not on prevention, but on intervention. As an example: Dr. Eisenberg and Jonathan Burgess, in their paper, “Nutrition Education in an Era of Obesity and Diabetes: Thinking Outside the Box,” write that coronary bypass surgeries may cost over $100,000 per operation, but many services that may reduce the risks of cardiovascular disease and avoid surgery (i.e., meeting with a nutritionist or health coach to discuss diet and exercise) are still not covered by insurance or are reimbursed at low rates. Americans are spending more on “healthcare” than ever, about $3.3 trillion in 2016 according to Kaiser Family Foundation. Healthcare spending outpaces the growth in the U.S. economy as a whole, and represents 17.9% of our gross national product. Resolving the financial mechanisms that drive healthcare delivery is an enormous challenge; the system, at this point, has its own gravitational pull. Of course, none of this is to suggest that we should stop providing care to the billions of people around the world who are sick, or stop innovating bold new treatments for disease. But here’s the rub: We’re spending more and more money treating more and more diseases that we shouldn’t be getting in the first place. And most of those diseases are related to diet and exercise. Of the four leading causes of death in the U.S., nutrition is a recognized determining factor in three of them (heart disease, cancer, and stroke). Two-thirds of the U.S. population is overweight, and obesity is linked to high blood pressure, Type 2 diabetes, cardiovascular disease, hardening of the arteries, some types of cancer, osteoarthritis, and other deadly or debilitating illnesses. Diabetes alone is estimated to cost the U.S. more than $245 billion per year. The system is set up to treat sick people. Most sickness is preventable. So why aren’t we focusing on prevention—things like eating a well-balanced diet, stopping smoking, moving more, getting enough sleep, and managing stress? Doctors are historically trained to diagnose and treat disease, not to promote wellness through lifestyle, diet, stress management, and practices like yoga and mindfulness. This holistic focus on wellness, called integrative medicine, is still a relatively new field. And Dr. Eisenberg is credited as one of its chief pioneers and advocates. As a Harvard Medical School student in 1979, he was the first American medical student sent by the U.S. National Academy of Sciences to China in an exchange program. That experience piqued a career-long interest in an integrated approach to health. In Chinese medicine, he says, “prevention is viewed as superior to intervention, and the physician’s role is to model healthy behavior and help the patient achieve wellness. Only the inexpert physician would have to intervene. The Chinese notion that how you eat, how you move, and how you think—meaning how you control your emotions and psyche—impact your health and give you the power to restore your body, written 25 centuries ago, is incredibly prophetic. In 1993, Dr. Eisenberg published an influential study in the New England Journal of Medicine that showed that Americans were using alternative treatments (like massage therapy, herbal supplements, and relaxation techniques) at a much higher rate than previously known. The report was visionary and groundbreaking, according to Dr. Sian Cotton, University of Cincinnati professor of family and community medicine and Director of its Center for Integrative Health and Wellness. Dr. Eisenberg argues that “‘salutogenesis’—the study of the creation and maintenance of health and well-being—should assume its rightful position alongside the study of ‘pathogenesis’—disease diagnosis and treatment—in medical education and practice.” Yet only about 25% of U.S. medical schools teach the recommended 19 hours of nutrition education in a four-year program. Across the country and here in our community, Dr. Eisenberg, Dr. Cotton, and a group of clinicians and academics are trying to change the way medicine is taught and practiced. And specifically of interest to us here at Edible Ohio Valley, they’re trying to institutionalize the connections among food, cooking, and wellness. Research overwhelmingly shows that eating a healthy diet, being active, and managing stress can prevent disease. And cooking at home with whole ingredients is a key component of that healthy diet. Dr. Eisenberg has a radical theory: That teaching people to cook can impact health—and, ultimately, the cost of healthcare. That’s the premise behind the Teaching Kitchen Collaborative (TKC). It’s a national network of 32 affiliated institutions—including the Cleveland Clinic, Kaiser Permanente, medical schools at Northwestern, Stanford, Michigan, and other universities and medical centers—that have built kitchens designed as life-skills laboratories. Teaching kitchens also exist in corporate worksites such as Google and in community settings like the YMCA and Boys and Girls Club. In 2015, a Cincinnati group interested in the intersection of food and medicine attended the HKHL conference in Napa, CA. Among them were Dr. Cotton; neurosurgeon Dr. John Tew of UC’s Neuroscience Institute; Robert Edmiston, executive director of Turner Farm; and Turner Farm board member Annie Ilyinsky. Meeting with Dr. Eisenberg, the locals were sold on the idea of instituting a teaching kitchen in the Ohio Valley. And they agreed that Turner Farm was the perfect location because it added sustainable agriculture to the food-health continuum. Turner Farm’s teaching kitchen opened in 2016, with CIA-trained chef Stephanie Michalak brought on to teach classes and be part of the programming team. It’s a beautiful facility, built in an old farm building and outfitted with quality equipment and bespoke cabinetry. At the top of a gentle rise, it’s surrounded by vegetable beds, animals, and the farm’s organic operation. 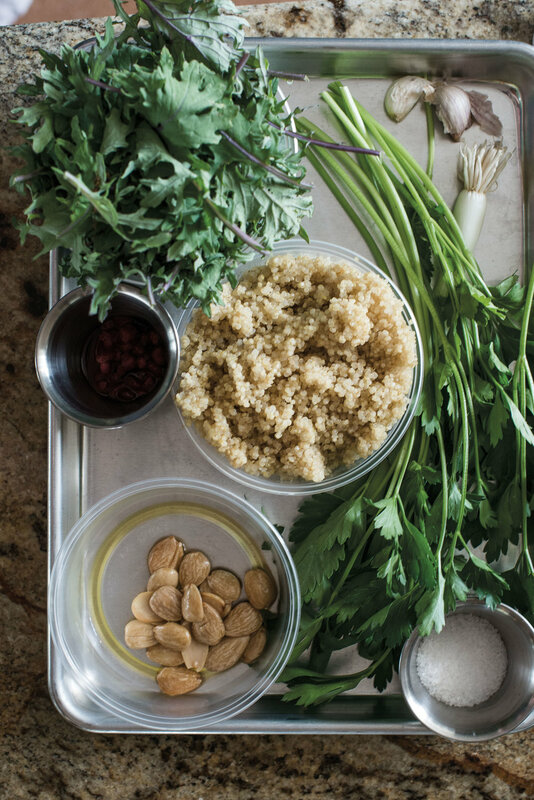 Unlike traditional cooking classes, these teaching kitchens blend nutrition science, mindfulness, and behavioral health with the art of preparing beautiful, easy, and tasty food. “It pairs medical school expertise with the beautiful farm setting, the platform of the kitchen, and the chef’s expertise,” Dr. Cotton says. “We’re the academic health system in Cincinnati. Everything we do is evidence-based, so my goal is to get science into the community. Turner Farm’s teaching kitchen focuses on two audiences: 1) Medical students and practitioners. Dr. Cotton leads UC’s efforts to get students and clinicians out of lecture halls and offices and onto the farm, where they dive into the science of wellness, the restorative power of mindfulness, and the art of cooking. These all-day workshops—designed to spark interest so that students continue exploring on their own—involve participants from different medical disciplines. Faculty present students with the science, and then they all head into the kitchen where Michalak guides them through a hands-on cooking experience tied to what they’ve heard. And 2) The Ohio Valley community. Michalak partners with physicians in UC’s integrative health program to develop classes focused on the food-health connection. Topics include healthy eating for cancer care, gut health, and healing foods. 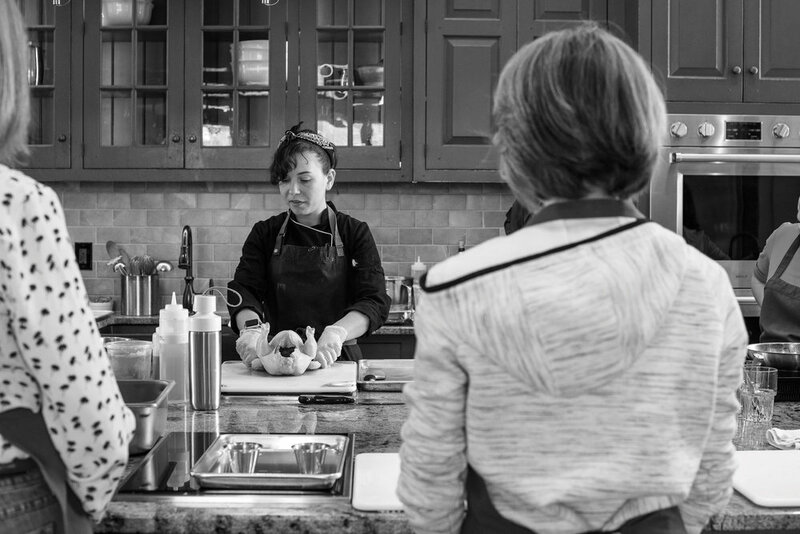 These two-hour sessions feature a UC medical professional teaching the science and Michalak teaching practical cooking skills related to the discussion. Michalak also teaches standard cooking-school classes like knife skills, making stocks, and other home-cooking basics. Both Dr. Cotton and Dr. Eisenberg say that the lasting impact from the Teaching Kitchen Collaborative’s work won’t just be capable home cooks; it will be research, best practices, and evangelism that will entwine the tenets of cooking and healthy eating into the broader culture. As medical professionals and ordinary folks learn the joys of cooking and eating good food, as we realize how good we feel on a beneficial diet, as we see the financial impact of wellness, this has the potential to replicate on its own. Breaking bread together begets conversation, so people who learn these new skills are naturally positioned to pass them along. For Dr. Eisenberg, the next big step is to leverage collective expertise across the growing TKC network to build out the science. In this way, each teaching kitchen sparks the kind of “garage innovation” that Hewlett, Packard, Jobs, and Bezos dreamed up in their backyards. “In order to prove the value proposition that these teaching kitchens have, we have to prove or disprove that they can predictably change behaviors, improve objective health outcomes, and bend cost curves. So we need to build a unified platform to collect data on the thousands of people, in various settings, who are going to go through these programs,” Dr. Eisenberg says. That will take funding, plus time commitments, from medical professionals and researchers. Dr. Eisenberg and his collaborative partners are also out to eradicate the perception that cooking and eating healthfully are time-consuming, expensive, and low on the yum factor. 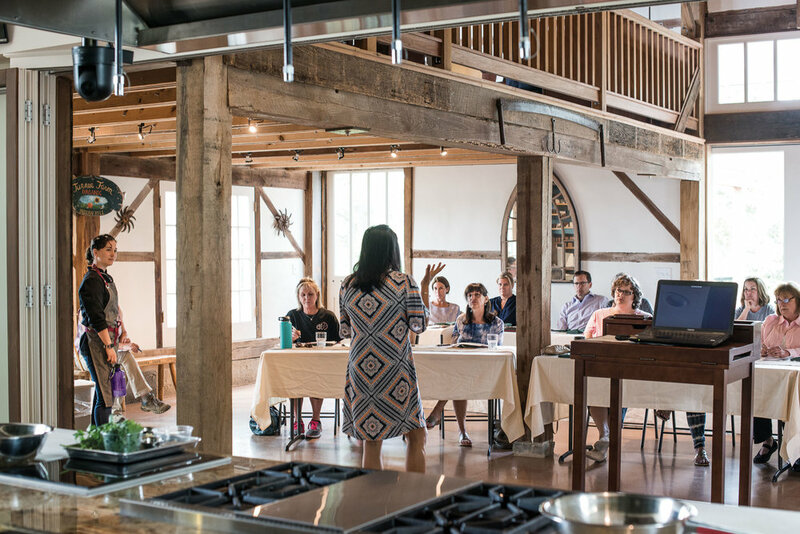 A class at Turner Farm in late April on gut health may not, on its face, seem all that appetizing. UC integrative medicine practitioner Dr. Lauri Nandyal shared how our environment, our bodies, relationships, sleep patterns, eating habits, and emotional state are all connected. She quoted Michael Pollan: “Eat food. Not too much. Mostly plants.” She showed the pathways by which we eat and swallow and digest and absorb nutrients from food. She discussed stomach acid and intestinal microbes and bowel movements. Hardly your typical table conversation. Then the class moved into the kitchen, where Michalak enthusiastically led participants through making kimchi and kombucha—fermented foods loaded with probiotics that support gut health and function. A light lunch followed. It was all delicious. Conversation with Dr. Eisenberg is well-seasoned with that word: ‘delicious.’ Perhaps that’s not surprising to hear from an avid home cook who’s the son of a Brooklyn baker. But deliciousness is essential to the TKC mission. “It’s an urban myth that healthy food tastes like sawdust,” Dr. Eisenberg says. “Think of every ethnic cuisine: 80% of the daily fare of most of those countries is plant-based and it’s tasty and delicious. Teaching kitchens are about knowledge. Knowledge is power. And having power means we’re in charge of our own well-being. Not pharmaceutical companies or health networks. Not insurance providers. Not Big Food. “We need to be proper stewards of ourselves,” Edmiston says. “That’s what the integrative wellness community is about: giving people the tools to take care of their own health and wellness.